It’s necessary in swimming pools and in-ground spas to filter the water. This traps debris and contaminants and helps to keep the water clean and safe. The filter unit contains a media that the water passes through. Sand is still the go-to filter media for most domestic and commercial swimming pools. With advancements in technology, there are now filter media alternatives such as glass and OC-1. In this post I look at the filter media options. And compare them on a range of factors including efficiency, environmental impact and cost. To keep swimming pool water clean and safe filters have to be able to capture infinitesimally small particles. In addition to trapping dirt and debris. This plus the ‘surface area’ available for debris capture determines how efficient a filter is. Sand: Sand filters work by a process of ‘entrapment’. Capturing particles as small as 20 microns. Particles lodge into the sand bed and become part of the filtration system. In turn increasing the efficiency of the filter (to a point). However, this ‘entrapment’ of debris causes a build-up of pressure. Therefore, regular backwashing is required to reduce this pressure and maintain filtration efficiency. Plus, the sand only captures debris through the top 6 inches of the filter. Contaminants are not evenly spread across the filter surface area. And the natural sand consistency leads to clumping, creating channels that the water passes through unfiltered. Glass: Glass captures particles approximately 5 microns small (some manufacturers claim as small as 3 microns). This is a result of the negative charge of glass. Which particles stick to like a sock sticks to a static sweater. Backwashing releases the charge and contaminants are flushed out. The lower density of glass (in comparison to sand), increases filter efficiency by about 30%. Plus, glass filters use 15% less media for a comparably sized filter. OC-1: OC-1 filter media catches between10-micron particles in a single pass. And removes particles as small as 1 micron. All with no flocculation or coagulation. OC-1 uses a process of ‘settlement’ compared to ‘entrapment’. This enables debris to settle through the entirety of the media bed, rather than being ‘trapped’ on the surface. Therefore OC-1 has a huge debris capacity in comparison to sand and glass filter media. 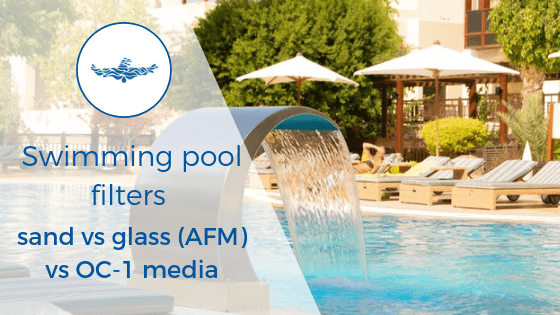 OC-1 filter media uses a revolutionary design process to capture tiny particles in pool water. And has a massive capacity for holding debris. As such OC-1 comes out our winner for filter efficiency. OC-1 is the winner for filter efficiency. Running a swimming pool can be expensive, and environmentally damaging. Care should be taken to reduce energy and water consumption. In an effort to reduce cost and environmental impact. Sand: Sand is the benchmark for glass and OC-1 comparisons. Sand filter media offers no energy or water savings. Weekly backwashing is required in sand filters to reduce built-up in pressure as a result of debris settling in the sand bed. This uses a substantial amount of water. This water is then replaced and re-heated. Both at a cost. Glass: The density of glass improves the water flow. And as a result glass media needs less backwashing. This results in up to 23% less water usage. Which, in turn, reduces energy and water costs. OC-1: OC-1 really comes into its own in energy and water savings. The open cell design makes it possible to achieve a greater flow of water through the filter. A pump speed reduction of around 20% is achievable (with a VDR), without compromising the flow. This produces impressive energy savings (estimated on quotation). Not only does OC-1 result in significant water savings due to increased flow and reduced backwashing. But it has also utilised advancement in variable speed pumps, which can allow for a reduction in pump speed. This can result in a payback of 6-12 months for the media on energy savings alone. OC-1 is our winner for energy and water savings. Environmental friendliness is top of many customers and companies wish list. Both in terms of energy savings and recyclability. Sand: At the end of its life sand filter media is disposed of. If you live near a beach then putting it back into nature may be an option if environmental laws allow for it. But normally waste sand is put into landfill. Glass: Glass filter media is actually one of the few products born to utilise an existing surplus. Drinks companies cannot reuse multi-coloured glass beads. 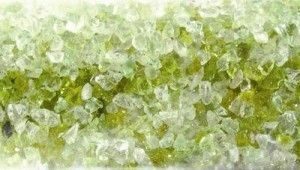 Glass media capitalises on this by recycling glass beads to create an effective filtration media. Double points to glass media. After its lifetime glass is disposed of. However many supporters argue that glass beads never need to be changed. They suggest you clean with chlorine or acid to improve efficiency. OC-1: At the end of its life, OC-1 filter media is fully recyclable. Which, makes it a popular choice for companies or individuals with swimming pool sustainability high on the agenda. We call a draw between glass filter media and OC-1. Filter media is removed and replaced every few years. This ensures ongoing filter efficiency. A long lifetime coupled with a high efficiency is preferable. 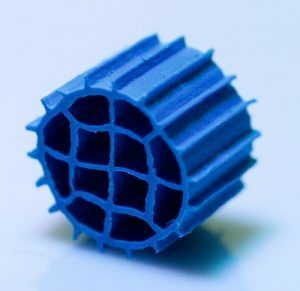 In order to reduce filter media replacement costs and pool downtime. Sand: Sand has the shortest lifespan of the three filter media, lasting approx. 3 years. Glass: Glass has a slightly longer life and will last upwards of 5 years before needing to be replaced. However, supporters of glass media suggest that it never needs to be replaced. When efficiency starts to drop they suggest a wash using chlorine or acid. Plus a top-up of the glass. 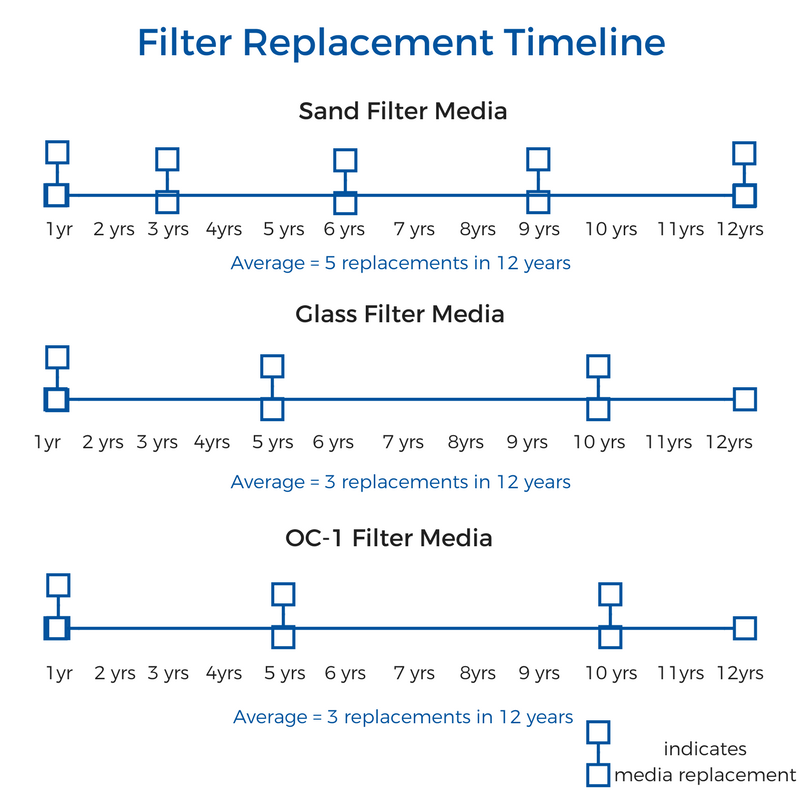 OC-1: OC-1 filter media will last around 5 years before it needs to be replaced. Please note times are dependent on usage and relate to commercial properties. Other properties may vary. Both glass and OC-1 last upwards of 5 years before replacement. Again, glass and OC-1 filter media tie as our winner. The cost of the filter media itself varies. Both initial cost and lifetime costs need to be weight. 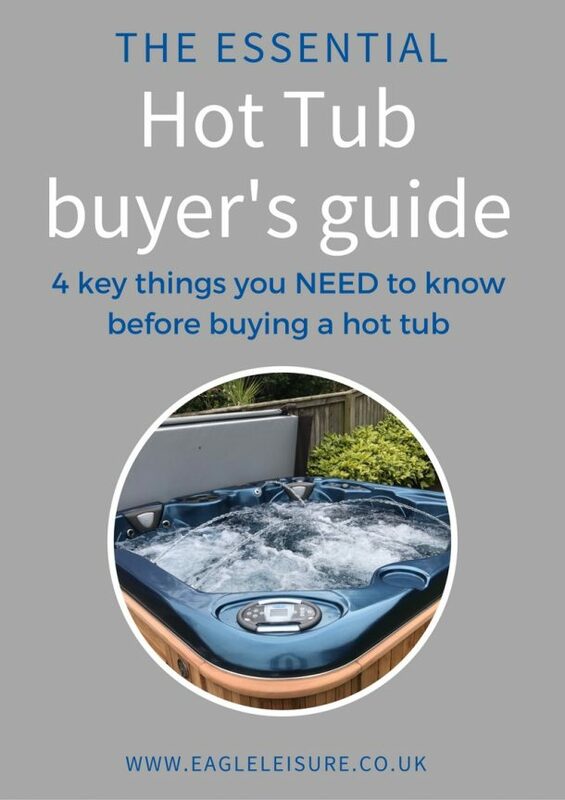 The cost will greatly vary depending on the size of the filter use, which will depend on pool water volume. Sand: Sand is the cheapest per bag at approx. £17.95 + VAT/bag (25kg). 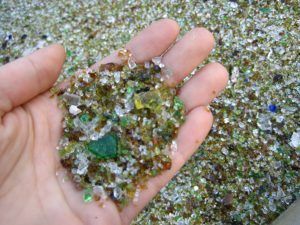 Glass: Glass is marginally more expensive than sand, at approx. £18.95 + VAT/bag (25kg). With approx. 15% fewer media needed for comparable filters. OC-1: OC-1 is the most expensive at £63 + VAT/bag (50litres). But payback is within 6-12 months typically on energy savings. This cost covers supply only, installation costs extra. If you retrofit an older filter with new media, this may incur a one-off charge due to increased labour. Going only by cost may be a false economy. Ongoing energy savings and replacement frequency need including in comparisons. In a period of 12 years: sand will need 5 replacements; glass and OC-1 will need 3 (on average). If initial outlay is your number one priority then sand is your winner. However, long-term savings must be considered. Over the long-term, both glass and OC-1 are competitive on price. What filter media is best for you, depends on a couple of factors including budget and use. But our overall winner is going to have to be OC-1. With the advent of OC-1, they’ve not reinvented the wheel. They’ve completely revolutionised it. Creating a new, more efficient way to filter water that can produce massive savings in energy and water. These savings (in our opinion) outweigh the higher installation costs. Especially in commercial properties where replacing filter media can be an expensive project. Plus is recyclable and so fits in with our sustainability values, that we try to promote to customers. Sand filter media: is it best for you? Glass filter media: is it best for you? OC-1 filter media: is it best for you?